Our keystone snap-in modules provide a full range of solutions for voice, home networking, home office, audio/video and more. With the wide selection of snap-in modules, you can custom-configure your keystone wall plates and patch panels for greater control and more flexibility. 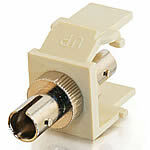 Use this coupler for SC fiber applications; just snap it into patch panels, compatible wall plates and surface boxes. 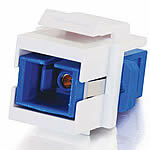 Feedhrough coupler for ST fiber applications.